WyreStorm will make available their new 8×8 HDMI matrix switcher this month. The professional grade switcher will allow up to eight HDMI audio/video devices to be independently switched to eight HDMI capable monitors, HDTVs or projectors. The outputs can show the same or different source at the same time, even if the source is HDCP protected. Each output includes one HDMI type A connector and a set of dual RJ-45 connectors as the second mirrored HDMI output. The two outputs work simultaneously. The UTP output supports both dual and single cat5e/cat6. The ability to read and save EDID (Extended Display Identification Data) function from displays. It supports multiple high definition resolutions, including 1080p, 1080i, 720p and other standard video formats. Each input port supports both HDMI and DVI inputs. There are six switching control modes: front panel buttons, local IR, IR call back from remote locations, RS232, RS485 and Ethernet (IP). Includes eight IR emitters to control the HDMI sources as well as an infrared extension receiver. 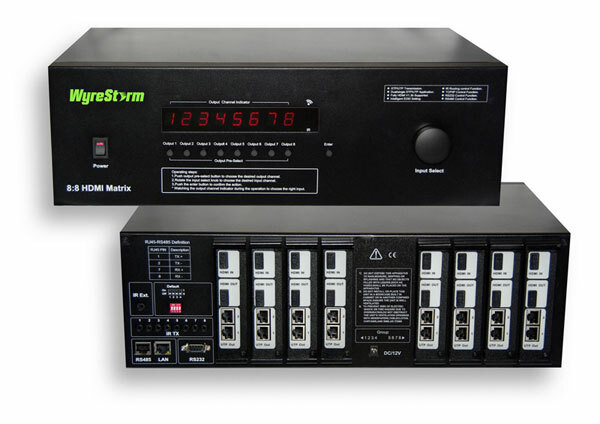 The 8×8 HDMI matrix switcher is HDCP compliant and uses HDMI version 1.3b. WyreStorm is a new company that was started by professional home theater installers. The company will launch with their premiere product on June 15. You can find more info at www.wyrestorm.com.